Installed Solar Panels May Impact Your House Sale! The Sun is Shining! Solar energy generation to power our homes is becoming a very popular alternative to buying power from the established power utilities. As the number of people who install solar panels on their house increases, the power companies are having to deal with decreasing revenues and changes to the makeup of the national energy grid. While there is a public policy push toward switching to green energy, the established power companies are not going to give up their big profits without a fight. It is an interesting dichotomy to see government subsidies for the installation of green energy on one hand and the corresponding cost and rate increases levied by the utilities to help preserve their profits on the other. Impact on the Sale of Your House: While the financial benefits of having a solar energy system may be appealing to a homeowner, your leased solar energy system may present an obstacle to the sale of your house. If your house has a solar energy system that is leased, the new owner will have to accept the terms of that lease or the leased system will have to be purchased or removed. Read the article below to learn more about the impact that a leased solar energy system may have on the sale of your house. If you need to finance your solar panel purchase, the most cost-effective way to do it is to use a home equity loan or a home equity line of credit (HELOC). Because your house serves as collateral, these options have low interest rates (currently about 3 to 5 percent). The interest you pay is tax deductible. Equity loans range from 5 to 20 years and usually have fixed interest rates. Equity lines last 10 years and have variable rates (so the interest may increase). Some solar leasing companies may offer to relocate their systems from one house to another. That could cost $500 for an initial audit and another $500 to transfer the panels, if the leasing company determines it can be done. You would also need approval from your utility and local landmarks commission or the condo or homeowner’s association, if applicable. Plus the new house must be able to accommodate the old system. 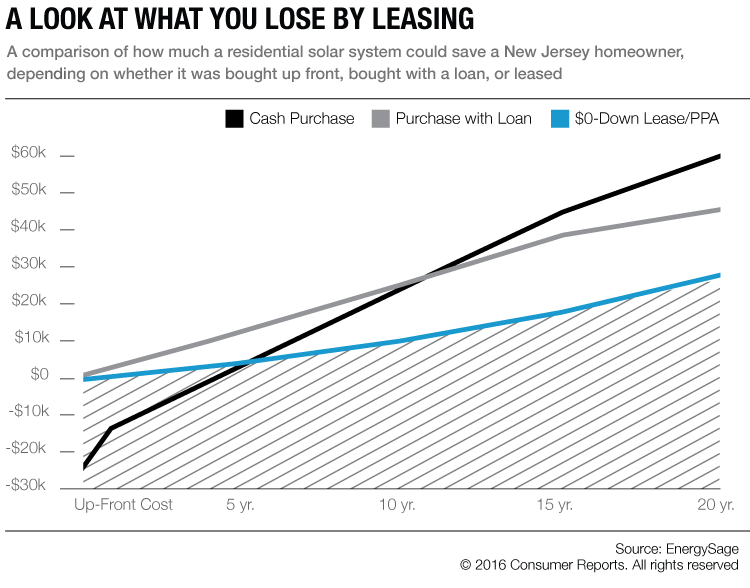 And remember: At the end of the lease, the solar company could remove the system—and your savings along with it.